Cutler Bay is located from SW 184th Street, also known as Eureka Drive, east of US1 to the coast, and north of Black Point Marina. The community of Cutler Bay was incorporated in November, 2005. 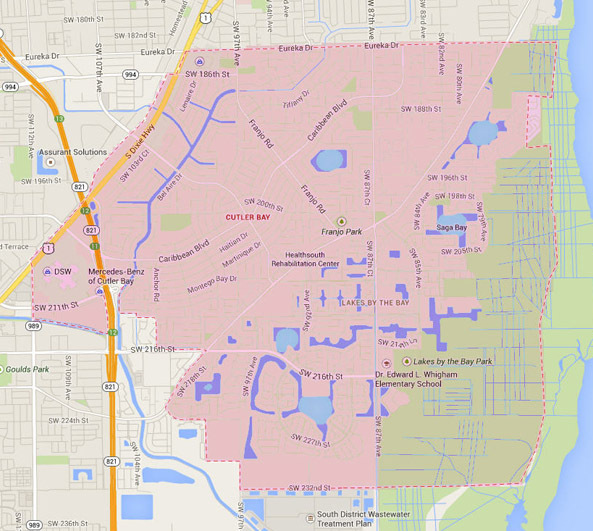 Today Cutler Bay is home to over 40,000 residents. In August 1992, Cutler Bay was greatly affected by Hurricane Andrew, a Category 5 hurricane and one of the most powerful storms to have ever struck South Florida. Hurricane Andrew destroyed over 25,500 homes and damaged over 100,000 others. Since then, the community has established emergency hurricane plans to help keep the area protected. Cutler Bay has many sites to see for visitors and residents. Among these places is the Charles Deering Estate. The Deering Estate at Cutler is a 444-acre estate on the East side of Old Cutler Road with globally endangered pine rockland habitat, as well as a habitat for rare and native plants such as orchids, bromeliads, and 40 species of trees. The Estate serves as an outdoor classroom and laboratory for students and scientists. Deering Estate offers guided tours, as well as eco-adventure tours which are limited and available by registering with the ticket office at the estate. These eco-adventure tours are biking, kayaking and canoeing with a guide to explore the nature in Deering Estate and the bay. The estate also offers lectures, community classes, and rental facilities for social events like corporate parties and weddings. The social events can be held in the library, ballroom or court yard. There are several parks that can be enjoyed at Cutler Bay. Some of the Cutler Bay parks include Bel-Aire Park, Cutler Ridge Park, Franjo Park, Saga Bay Park, and Whispering Pines Park. Visitors can enjoy the views, play sports, relax, and be involved in special community events at the parks. Bel-Aire Park is approximately 5.2 acres and has an open field for sports with bleachers, a concession stand and a small children’s play area. Cutler Ridge Park is the second largest park in Cutler Bay. This 11 acre park has several open fields for sports activities, as well as a public pool, a large gazebo and community center, a single tennis court, and a walking path. Cutler Ridge Park is known for hosting events such as sporting events, an Easter Egg Hunt and a Chili Cook-Off. Franjo Park is a 5 acre park just off Old Cutler Road. This park was perfectly planned for sporting events, with three lighted softball/baseball fields, batting cages, bleachers, a concession stand, water fountains, and picnic tables. Saga Bay Park is a 5 acre park with four lighted tennis courts, covered children’s play area, circular walking path, picnic table and benches. The park has a large field for visitors to enjoy playing their sports. Whispering Pines Park is a 1½ acre park located by Whispering Pines Elementary School. The park has several picnic tables, a gazebo and a large covered playground. Cutler Bay hosts a 4th of July parade every year at Whispering Pines Park. Whispering Pines Elementary, Cutler Ridge Elementary and Bel-Aire Elementary are just a few of the public schools in Cutler Bay. The magnet schools by the Cutler Bay area include Southwood Middle and Coral Reef Senior High School. Magnet schools offer a specialized curriculum for students. Some of the private schools near the Cutler Bay area include Westminster Christian School, Palmer Trinity School and Cutler Ridge Christian Academy. The community of Cutler Bay promotes going green and encourages environmental responsibility for all its residents. The Property Assessed Clean Energy (PACE) program enables residents to invest in solar panels, wind generators and other forms of green energy that is sustainable and beneficial for the Earth. This movement is also active in other South Florida municipalities, such as South Miami, Coral Gables, Pinecrest, and Palmetto Bay. Cutler Bay was successful in passing the Financing Initiative for Renewable and Solar Technology (FIRST) bill, which allows home owners to voluntarily enter in a program that allows the district to give them a loan for the cost of installing an alternate energy-producing device. In return, the home owners would repay the cost of the loan over a period of time. Cutler Bay encourages residents and businesses to go green. The community is a great place to live for growing families and those who enjoy going to parks and fun activities like sporting events. Cutler Bay is central to many of the attractions that South Florida has to offer. If you have any interest living in Cutler Bay, contact us and we will assist you with your real estate needs.